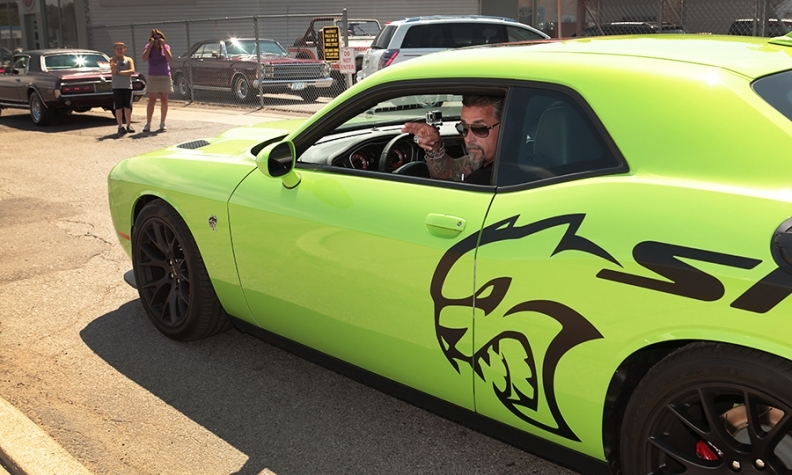 At the Woodward Dream Cruise outside Detroit last August, muscle car enthusiast Richard Rawlings was spotted in the Challenger SRT Hellcat to fuel the hype train. The 707-hp Hellcat trims of the Dodge Challenger and Charger sparked a viral flame on the Web after their unveilings last year. Dodge teased the Hellcat engine specs during its investor day last May and then revealed the Challenger SRT Hellcat two weeks later. But Dodge gave away few details about the supercharged sedan at the beginning. It let people wonder aloud in the social sphere last summer about the burning questions surrounding the new Challenger SRT Hellcat. What was the horsepower? It definitely won't have more juice than the 645-hp Viper, right? Dodge just stood back and let viral marketing magic do its work as the brand steadily released morsels of information -- showing just how powerful the Web can be for stirring up excitement well before any ads reach the airwaves. "I consider what we've done very efficient marketing," said Tim Kuniskis, Dodge brand CEO. "The goal is not to sell Hellcats. That's why people say, 'Why are you still talking about it if I can't even order one right now?' The real benefit is the halo effect it provides for the rest of the cars." 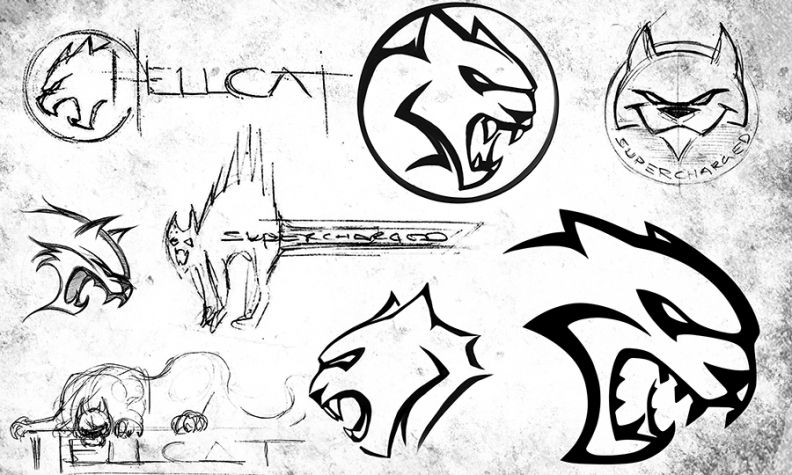 These sketches show the evolution of the Hellcat symbol. Dodge was in no hurry to release details on the Challenger SRT Hellcat. During the global unveiling last May, Dodge would say only that the engine kicked out more than 600 hp. Yet there were doubts among some that it would surpass the Viper's 645 hp, Kuniskis said. So Dodge allowed the horsepower debate to rage on for several weeks before finally dropping the 707-hp bombshell on July 1. The Web ate it up. People then said the Challenger was so big that 707 hp was a necessity, but there was no way it would actually be fast, Kuniskis recalled. Ten days after the horsepower announcement, Dodge tossed another coal into the viral fire with a video featuring muscle car aficionado Richard Rawlings that showcased the Challenger's performance chops. Rawlings, host of the car restoration show "Fast N' Loud" on the Discovery Channel, hit the drag strip in the video, which was posted on Fiat Chrysler's YouTube page. Dodge revealed in the July 11 video that the Challenger SRT Hellcat clocked in at 11.2 seconds in a quarter mile with production tires, a time that was certified by the National Hot Rod Association. When outfitted with street-legal drag radial tires, the sedan hit an NHRA-certified 10.8 seconds. For comparison, the quarter-mile time of the 2015 Chevrolet Corvette Z06 is 10.95 seconds with its Z07 package, which is equipped with Michelin Sport Cup tires and an eight-speed automatic transmission, Chevrolet says. Kuniskis: Halo effect is benefit. Other questions lingered after the horsepower was released. Kuniskis said the discussion then turned to the Challenger's pricing. Dodge, still patient, waited another two weeks after the horsepower reveal before saying that it would cost $60,990 with shipping. 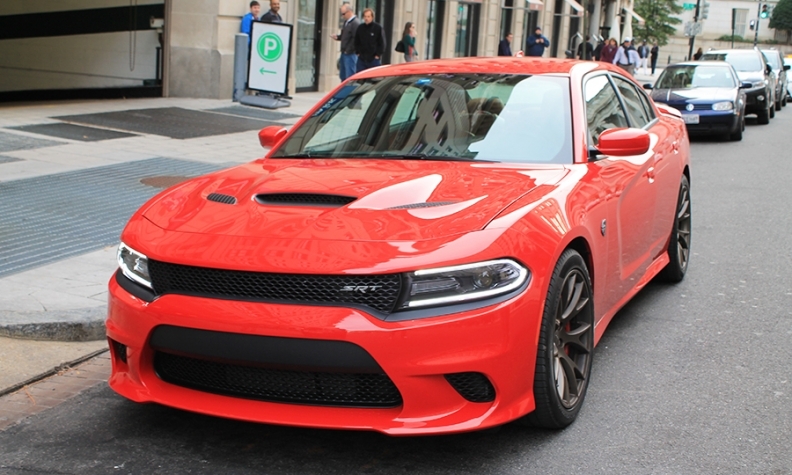 Dodge sustained the Hellcat momentum with the unveiling of the Charger version in August. At the Woodward Dream Cruise outside Detroit, also in August, Rawlings was spotted in the Challenger SRT Hellcat to fuel the hype train. In the months to follow, Dodge added popular Hellcat thrill rides to its marketing repertoire on drag strips it sets up at various events. Kuniskis said thrill seekers, who sit in the passenger seat during the rides, sometimes wait hours in line for the chance. One event featuring the thrill rides was the Dodge Rocks Gas Monkey car show and concert for Challenger, Charger and Viper owners at Rawlings' freshly built Gas Monkey Live concert venue in Dallas. Rock band Motley Crue performed during the free event in November. In October, after several months of promotions that lived largely online and at events, the brand launched the Dodge Brothers TV ad campaign featuring the Challenger and Charger Hellcats. The Hellcat craze has been massive, but would it have been so potent without Dodge's slow and steady marketing approach? "Did we fuel the fire? Of course we did. How big would the flame have been without it? I don't know. That's impossible for me to say," Kuniskis said. "Right now, it's a big flame." Dodge halted orders of the Challenger and Charger Hellcats in March to catch up on a production backlog. But Kuniskis pointed out that they're likely having a trickle-down effect on the lower trim levels. The Challenger had its best sales month ever in April when 6,771 were sold, a 32 percent increase from April 2014. The story was the same for the Charger, which posted its best April in seven years with sales of 9,063 units. That halo effect extends beyond the cars. Dodge's followers on YouTube, Facebook, Twitter and Instagram have ballooned by more than 1 million since the Hellcats hit the scene. Those looking for Hellcat content on YouTube, for instance, will see famous faces such as Jay Leno and Rawlings burning rubber in the Challenger in videos that have gotten more than 4 million views combined. Leno invited Dodge to bring the Challenger on his NBC show "Jay Leno's Garage" and went for a ride with Kuniskis. It was free exposure that had legs online. Kuniskis said social media is about getting potential shoppers aware of the brand. "Social media, viral marketing, events where I intersect with you in your normal, everyday life, that's going to get to you no matter what," Kuniskis said. "You're not looking for a car today, but you may be in the future. That's where I see a huge benefit. Intersecting with your normal life and getting on your radar." A quick glance at the early Challenger SRT Hellcats shows just how powerful social media can be. 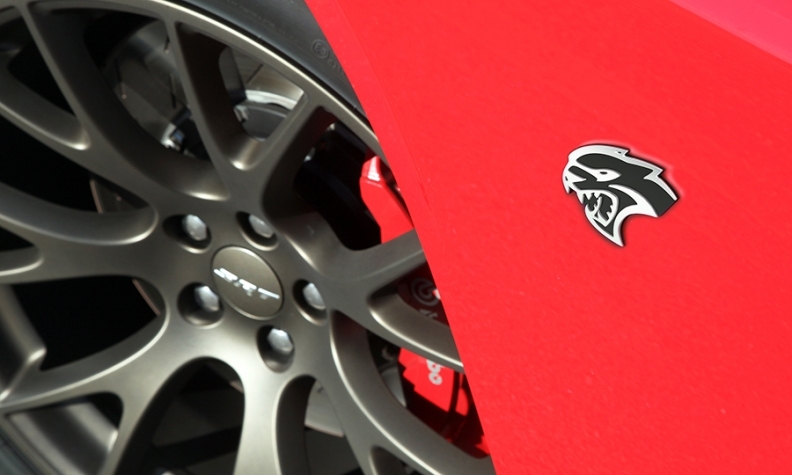 The famous Hellcat logo that's now on the side of the car? It wasn't there when the car was unveiled. In fact, Dodge had no intentions of using the Hellcat moniker. That was just a code-name for the engine within the company. But it soon caught on among the public, and the brand noticed that people liked the logo as well. "It was originally just supposed to say 'supercharged' on the side of the car. But [the logo] got so much attention in social media that at the last minute, we changed from 'supercharged' to the actual logo on the car," Kuniskis said. The initial media photos Dodge released of the Charger SRT Hellcat didn't have the logo either, but it was on the model Dodge showed during its August reveal at the Vinsetta Garage restaurant in suburban Detroit. 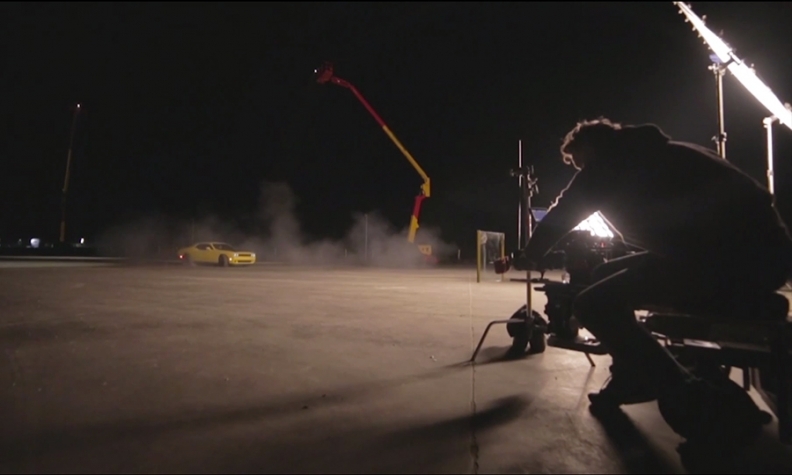 The Hellcat's imposing engine roars made it the perfect fit for the high-intensity role in Pennzoil's "Airlift Drift" mini-film. The Hellcats also show that American muscle has global appeal. During filming for Pennzoil's "Airlift Drift" video with the Challenger SRT Hellcat in Cape Town, South Africa, some locals offered to buy it on the spot, said Doug Kooyman, global brand director of Shell Lubricants. The Hellcat's imposing engine roars, Kooyman said, made it the perfect fit for the high-intensity role. Pennzoil posted the 90-second piece online March 25, igniting even more viral attention for the Hellcat. Shorter TV spots, which basically serve as trailers for the Web video, began running March 30. Kuniskis said the oil company approached Dodge to get permission to use the Challenger. Dodge agreed. Pennzoil's Facebook post of the video has drawn more than 880,000 views so far and has surpassed 725,000 views on YouTube. Another video giving a behind-the-scenes look at the spot has attracted nearly 2 million views on Facebook. "The Hellcat stands apart a bit when it comes to sound and that raw, almost animalistic, sound you get from the supercharger and the roar of the engine and the American muscle that comes through," Kooyman said. 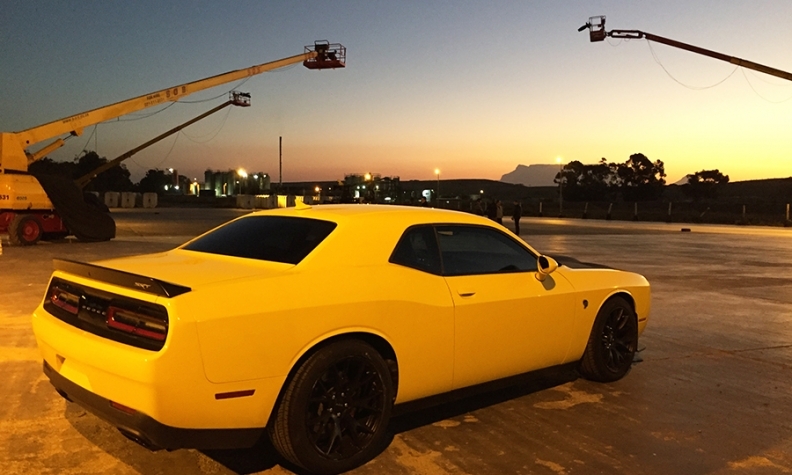 Filming for Pennzoil's "Airlift Drift" video with the Challenger SRT Hellcat took place in Cape Town, South Africa. It was a viral hit. The Challenger and Charger Hellcats have inspired an ad campaign slated to launch this summer. Fiat Chrysler doesn't need to do a campaign, but the automaker couldn't resist, said Olivier Francois, FCA's global chief marketing officer. "We created [the campaign] because we couldn't help it. Will we use it? Economically, it sounds like it makes no sense," Francois said. "Marketingwise, it does because you still see a Challenger and a Charger." Get a behind the scenes look of how we took the performance of a 707hp Dodge Hellcat Challenger to new heights in #AirliftDrift.